Read the Wells Fargo Cash Back College Visa® Card Agreement. A Wells Fargo Cash Back College Card can help you establish credit history as you buy the things you need while in college – and you can earn cash rewards. Wells Fargo reports your payment and usage behavior to the credit bureaus – the companies that calculate your credit score. Pay on time, every time. Making a late payment or missing a payment can hurt your credit score. Pay more than the minimum each month. When you pay less than the balance, your balance accrues interest. That means you have to pay more for spreading your payments out over time. Keep your balance low, relative to your credit limit. Never exceed your credit limit. Only charge what you can afford to pay back. Visit wellsfargo.com/pathtocredit to learn more about building and maintaining good credit. Online Access. Access your account balance and transaction details, pay bills, view your FICO® Credit Score and more from your mobile device or computer by enrolling in Wells Fargo Online and Wells Fargo Mobile®. Then, you can manage your accounts on the go with our Wells Fargo Mobile app or from your mobile browser. Automatic Payments. 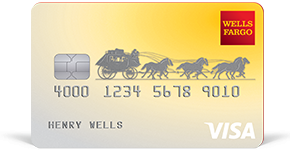 This optional service in Wells Fargo Online helps you automatically make credit card payments by transferring funds from your checking or savings account to your Wells Fargo Credit Card account. To set up automatic payments sign on to Wells Fargo Online, and access Pay WF Accounts through the Transfer & Pay menu. Account Alerts. Help stay on top of your account activity with email or text message alerts for when you approach your credit limit, a payment is due, and more. Set up account alerts through Wells Fargo Online or Wells Fargo Mobile. Budget Tools. Sort your monthly expenses against your budget with access to budgeting and tracking tools: My Spending Report and Budget Watch through My Money Map. Set up budget tools through Wells Fargo Online. Apply rewards as a credit to a qualifying Wells Fargo credit product. Visit GoFarRewards.wf.com to learn more about rewards. Review the Visa Guide to Benefits (PDF) and your account agreement to learn more. Zero Liability protection to help protect you from liability for unauthorized transactions when you report them promptly. Overdraft Protection (optional) by linking your credit card to your checking account, finance charges apply. See the full Terms and Conditions. Alerts to notify you of certain irregular or suspicious card activity. Mobile payment options to make convenient on-the-go purchases with your Wells Fargo card in a supported digital wallet. To apply online, you’ll need an existing Wells Fargo relationship (otherwise, please apply at a Wells Fargo location). When you open an account, we will ask for your name, address, date of birth, and other information that will allow us to identify you. We may also ask for your driver’s license or other identifying information. Unless an introductory or promotional APR is in effect, we will add a “Margin” to the U.S. Prime Rate to determine your standard variable APR. For each billing period we will use the U.S. Prime Rate, or the average of the U.S. Prime Rates if there is more than one, published in the Money Rates column of The Wall Street Journal three business days prior to your billing statement closing date. If the U.S. Prime Rate is not published or is otherwise unavailable, whether temporarily or permanently, we will select a substitute index that we believe, in our sole discretion, to be similar to the U.S. Prime Rate. The U.S. Prime Rate is 5.50 percentage points as of 04/20/2019. Regulation D and Wells Fargo limit certain types of withdrawals and transfers that can be made from your savings account to a combined total of six (6) per monthly fee period. If the limit is exceeded, an excess activity fee for each withdrawal or transfer over the limit will be assessed. If the limit is exceeded on more than an occasional basis, your savings account could be converted to a checking account or closed. Cash redemption options by phone or online are redeemable in $25 increments only. Cash redemptions by a withdrawal from a Wells Fargo ATM, or a rewards redemption to an eligible Wells Fargo account from a Wells Fargo ATM, are redeemable in $20 increments only. You must have a Wells Fargo Debit or ATM Card to redeem rewards at a Wells Fargo ATM. Certain restrictions and limitations apply. Please review the Visa Guide to Benefits (PDF) for details. Android Pay can be used with NFC-enabled devices running Android OS 4.4 (KitKat) or higher. Android Pay is a trademark of Google Inc.
Apple Pay-enabled devices include iPhone 6 and later and Apple Watch in stores, and iPhone 6 and later, iPad Pro, iPad Air 2, and iPad mini 3 and later within apps. For a list of compatible Apple Pay devices, see www.apple.com/apple-pay. Apple is a trademark of Apple Inc., registered in the U.S. and other countries. Apple Pay is a trademark of Apple Inc.
Samsung Pay can be used with the Galaxy S6, S6 active, S6 edge, S6 edge+, Note 5 and newer devices that are compatible with Samsung Pay. Visit http://www.samsung.com/pay.